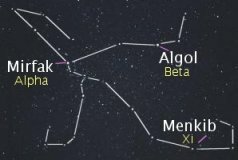 Image Credit: WIYN Consortium, Inc.
Late on the evening of February 21, 1901, the Scottish clergyman Thomas David Anderson was walking toward his home in Edinburgh when he cast a final "casual" glance up to the sky and noticed a brilliant third magnitude star in the constellation Perseus. His first feeling was one of disappointment because he felt sure that this star had been there for some time, escaping his notice, and he grudged the time lost when he might have been regarding it. The next day he reported his find to the Greenwich Observatory and was surprised to realize that he was the first discoverer of Nova Persei 1901, the first new star of the 20th century. Back at the Harvard Observatory, where the now famous collection of celestial photographs had been started under the direction of E. C. Pickering (co-founder of the AAVSO), it was found that the new star was actually not completely new. A number of early photographs show that in the position of the new nova there was previously a faint star of magnitude 13 that showed small fluctuations in light. It so happened that this Perseus region had been photographed just two days before Dr. Anderson's discovery and showed the star at its minimum brightness. Thus, in less than two days, it had brightened from the thirteenth to the third magnitude, an increase of 10,000 times in luminosity - an absolute explosion! A diligent watcher of the skies, Thomas Anderson discovered Nova Persei 1901. For the next two days, the star continued to increase in brightness, at a somewhat slower rate, until it reached a maximum of magnitude 0.2, about the brilliance of Capella and Vega. The total change in brightness was fourteen magnitudes and had been accomplished in less than four days. Immediately after the nova reached 0.2 magnitudes, it quickly (although not as quickly as it rose) began to fade. Six days after maximum, the nova had faded to second magnitude and two weeks later it reached the fourth. At this point, a series of oscillations set in, with a periodicity of about four days, and an amplitude of a magnitude and a half. These fluctuations lasted for several months, during which time the star continued to fade, until it was no longer visible to the naked eye. 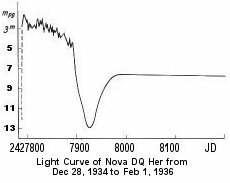 The nova returned to its minimum state, magnitude thirteen, eleven years after it initiated its brilliant adventures (see the light curve below). The white dwarf captures matter lost through the inner Lagrange point of the secondary. To conserve angular momentum, this material cannot accrete directly onto the white dwarf, but forms an accretion disk around the compact star. As it loses angular momentum, the material in the disk slowly drifts inward and accretes onto the surface of the white dwarf. An envelope or "ocean" of hydrogen-rich material builds up on the white dwarf surface. The intense heat and pressure at the base of this envelope leads to a thermonuclear explosion as hydrogen is burned to helium. The explosion blows off the outer layers of the envelope. This event is the observed classical nova outburst which generally lasts for tens to hundreds of days. Na: Fast novae. The rise is very steep and it lasts one or, at the most, just a few days; the decline is such that the brightness reaches 3 magnitudes below maximum within 110 days at the latest, and generally much sooner. Nova Persei 1901 is a good example of a fast nova. Nb: Slow novae. The 3-magnitude decline takes more than 100 days. Some of these novae show a deep, wide minimum about 2-5 months after maximum. This may be due to dust condensation that blocks the visible light. As the ejected material dissipates, the nova recovers to magnitude approximately equal to that expected in an undisturbed decline. Nc: Very slow novae. In 1915 the prototype, RT Ser, rose slowly to 10.5 magnitudes, remained at this level for almost 10 years, and then began to fade very slowly, reaching 14 magnitudes in 1942. Nr: Recurrent novae. These are novae where more than one outburst has been observed. In the final analysis probably all novae are recurrent, and the fact that as yet only one outburst has been observed in most novae is presumably only because the intervals are generally very long between outbursts. For an example of a recurrent nova's light curve visit the variable star of the month page for RS Ophiuchi. After the spectacular classical nova outburst in 1901, GK Per (Nova Persei 1901) began to display characteristics of a dwarf nova type cataclysmic variable around 1966. It was put on the regular AAVSO observing program in the late 1920s, and at that time until about 1966, it fluctuated irregularly between magnitudes 12.5 and 13.5, with a few rises to about 12th magnitude. But this quiet period would not last forever, and in the middle of August 1966, Nova Persei brightened to 11th magnitude. From 1966 to the present, Nova Persei (now more commonly called GK Per) has exhibited dwarf nova-like outbursts of about 3 magnitudes every 3 years. For a review on the dwarf nova type class of stars see VSOTM SS Cyg, SU UMa, and Z Cam. Around 1980, the discovery of X-rays coming from this system would allow scientists to more specifically classify GK Per as a magnetic cataclysmic variable. http://space-art.co.uk reproduced with permission.In the foreground, a magnetic white dwarf with a distant accretion disk obtains mass along its magnetic field lines. In the course of a dwarf nova like eruption of GK Per in 1978, Andrew King and his colleagues at Leicester University were the first to discover (with the Ariel 5 satellite) that GK Persei had flared in X-rays. The satellite, however, could only take readings every 100 minutes, so only the general character of the event was observed. In July of 1983, the AAVSO announced that this ex-nova was undergoing another minor outburst. This alerted King and Michael Watson who had been given time on EXOSAT to observe GK Per when it brightened. They observed GK Per and obtained data that revealed an X-ray pulsation period of 351 seconds. While not great enough to lock the companion star into synchronous rotation, this magnetic field is still strong enough to disrupt the inner portion of the accretion disk and channel material onto the white dwarf's magnetic poles. In the year 1901, after GK Persei underwent its classical nova outburst, there was a discovery that excited the astronomical community of the day. Only six months after Thomas Anderson observed the fantastic nova explosion of 1901, the French astronomer Camille Flammarion and his colleague announced that they had photographed a "luminous shell surrounding the nova". This puzzled astronomers because it implied that the debris thrown off from the nova explosion was traveling outward at a rate faster than the speed of light! Typically it takes years before the shell of matter ejected from such an event can be resolved in Earth-based telescopes. Charles Perrine and George Ritchey further observed bright knots of light changing position on photographs taken from month to month. The features appeared to be moving outward from the nova at the astonishing rate of 11 arc minutes per year - ten times the speed of light. This extraordinarily rapid motion caused much excitement among astronomers and in the popular press; a solution was needed. Paul Courderc suggested that a sheet of dust in front of Nova Persei 1901 would explain the superluminal light echoes around that star. The nova's flash is, in effect, a hollow, spherical bubble of light, shown to the right in cross section. First, radiation at the nose of this bubble hits the dust sheet along our direct line of sight and is forward-scattered toward Earth. Other rays meet the sheet off the line of sight a short time later and are then deflected toward Earth. These rays have only traveled the relatively short extra distances shown in red, but the echo appears to have expanded by the distance (shown in green) between the direct and deflected rays. Therefore the expansion appears to be proceeding faster than the speed of light. The apparent speed of the motion is infinite at the instant when the light-bubble's nose first meets the dust, but it slows as the ring grows. (However, at very early times the echo is too small to be resolved.) (Felton, J. S&T, February 1991, 153-157). Mystery solved! In general, light echoes can be seen for novae and supernovae. An observer sees light reflected by the imaginary expanding surface around the nova called the "kinematically accessible ellipsoid" which is an elongated ellipsoid with the nova at one focus and the earth at the other focus. 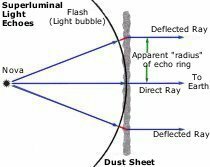 If dust is present in front of the nova (like Nova Persei 1901) "superluminal" echoes are observed which appear to be expanding faster than the speed of light. Almost fifteen years after the outburst, the actual nebular shell around Nova Persei finally became visible and is colored red in the image at the top of this page. Observers with moderate aperture telescopes will find it rewarding to follow any future variations of GK Persei. This energetic star can be found in the region between the famous variable Algol (Beta Persei), and the brightest star of the constellation, Alpha Persei. Currently, GK Per is at its minimum around magnitude thirteen. To keep updated on the star's activity use the AAVSO Light Curve Generator to check your observations with those from other observers. You can easily make charts for GK Per using our chart-making utility, VSP. AAVSO Monograph 13: GK Persei Light Curves 1901-1902 and 1963-1995. Bianchini, A.; Sabadin, F.; "The old-nova GK Per (1901)", Astron. Astrophys., 125, 112-116 (1983). Bianchini, A.; Friedjung, M.; Brinkmann, W.; "New light on post-maximum oscillations of novae", Astron.Astrophys., 257, 599-602 (1992). Bode, M.F. ; Evans, A.; Classical Novae, Chichester, New York, 1989. Campbell, Leon; Jacchia, Luigi, The Story of Variable Stars, The Blakiston Company, Philadelphia, 1941. Cordova, France; Mason, Keith; "Exosat: Europe's New X-ray Satellite", Sky and Telescope, May, 1984, pp.397-401. Felton, James E., "Light Echoes of Nova Persei 1901", Sky &Telescope, February, 1991, pp.153-157. Hoffmeister, C.; Richter, G.; Wenzel, W.; Variable Stars, Springer-Verlag, Berlin, 1985. Mayall, Margaret W., "Report on the Flare of Nova Persei", Report of Popular Astronomy, 542, Nov.-Dec., p.12, 1966. Payne-Gaposchkin, C.; The Galactic Novae, Dover inc., New York, 1964. Sabbadin, F.; Bianchini, A.; "The old-nova GK Per (1901). IV. 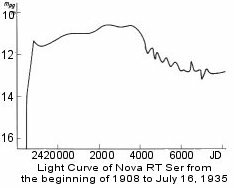 The light curve since 1901", Astron. Astrophy. Suppl. Ser. 54, 393-403 (1983). Szkody, P.; Mattei, J.A. ; Mateo, M.; "The 1983 Outburst of GK Persei", PASP, 97:264-267, March 1985.